In 1913 Briton Hadden was sent to Hotchkiss School in Connecticut, where he met Henry Luce, another young man who was very interested in becoming a journalist. Soon after arriving the Hotchkiss Record, announced a new competition for sophomores. The student who showed the most "natural ability" would be taken onto the board of the newspaper. Hadden came first, beating Luce into second place. Luce wrote to his father: "I am second though quite far behind the first fellow (Hadden) and while I am not satisfied with second place, yet I think it was worthwhile." Hadden and Luce both went to Yale University and found themselves in competition to have their work published in the Yale Daily News. This involved what was known as "heeling rituals". Between October and March, the young students (heelers) wrote articles, sold advertising in the newspaper and performed various tasks for the editorial board. The editors awarded a certain number of points for each task. At the end of the competition, the top four heelers were appointed to the staff of the newspaper. Alger Shelden, the son of a millionaire attempted to buy his way to victor. However, he could only finish second to Hadden, who won with more points than any heeler in history. Luce finished in fourth place. Luce wrote to his father: "I have come to Rome and succeeded in the Roman Games." The following year Briton Hadden was elected chairman of the Yale Daily News for a second time and Luce won election as the managing director. During this period the two young men became very close. Luce later commented: "Somehow, despite greatest differences in temperaments and even in interests, somehow we had to work together. At that point everything we had belonged to each other." Hadden's written style was deeply influenced by his English professor, John Milton Berdan. In his classes he encouraged his students to communicate to a mass audience. Hadden remembers him saying: "Your job is to write for them all." He argued that the most important thing for a writer was to observe the world, "to see for oneself". Berdan added that you kept the reader's attention by communicating with "brevity, clarity and wit". After graduating, Briton Hadden went to New York City in an attempt to find a newspaper job. He greatly admired the work of Herbert Bayard Swope, the editor of the New York World. Hadden marched into Swope's office unannounced. Swope yelled: "Who are you." He replied: "My name is Briton Hadden, and I want a job." When the editor told him to get out, Hadden commented: "Mr. Swope, you're interfering with my destiny." Intrigued, Swope asked Hadden what his destiny entailed. He then gave him a detailed account of his plans to publish a news magazine but first he felt he had to learn his craft under Swope. Impressed by his answer, Swope gave him a job on his newspaper. Hadden told Frederick Darius Benham, who worked with him on the newspaper, about his plans to publish a news magazine. Hadden once showed Benham a copy of the New York Times: "See this? Full of wonderful news, tells you everything going on in the world. But you haven't got time to read it all every day... I have got an idea to start a magazine which comes out on Friday with all the news condensed so you and all the other people commuting home for the weekend can catch up on the news they missed." In November 1921, Luce and Hadden, were working together on the Baltimore News-Post. They spent much of their spare-time discussing the possibility of starting their own news magazine. Hadden argued that most people in the United States were fairly ignorant of what was going on in the world. According to Hadden, the main problem was not a lack of information, but too much. He pointed out there were over 2,000 daily newspapers, 159 magazines and nearly 500 radio stations in America. The two men objected to the emphasis placed on entertainment by these various media organisations. The situation became worse when in 1919 a Chicago publisher, Joseph Medill Patterson, moved to New York City and launched his tabloid newspaper, the Daily News. Making good use of photographs, the newspaper concentrated on murder stories and celebrity scandals. Luce and Hadden intended to change this trend by producing a magazine that dealt with serious news. Luce wrote to his father: "True, we are not going out like Crusaders to propagate any great truths. But we are proposing to inform people - to inform many people who would not otherwise be informed; and to inform all people in a manner in which they have never been informed before." Over the next few months they began working on their proposed news magazine. Every day they cut-up the New York Times and separated the articles into topics. At the end of the week, they extracted the main events and rewrote the stories in their own words. Luce and Hadden showed these mock-ups to their former English professors, Henry Seidal Canby and John Milton Berdan. Canby thought the writing was "positively atrocious" and "telegraphic". Berdan was more sympathetic and accepted that the style was essential if they were to compete with movies, radio shows and billboards. Despite his criticism of the writing, Canby advised the men to continue with the project. Luce and Hadden resigned their jobs at the Baltimore News-Post and moved back to New York City where they moved in with their parents. They also recruited their friend, Culbreth Sudler, as their business manager. They drew up a prospectus that they could show prospective investors. It included the following: "Time is a weekly news magazine, aimed to serve the modern necessity of keeping people informed, created on a new principle of complete organization. Time is interested - not in how much it includes between its cover - but in how much it gets off its pages into the minds of it's readers." It added that the magazine "would entertain as well as edify" and argued that they would tell the news through the personalities who made the headlines. A friend of Luce's father introduced them to W. H. Eaton, the publisher of World's Work. He later recalled: "I spent a full afternoon with those fellows going over their first dummy, discussing their editorial philosophy. They certainly were intense about the whole thing, and Hadden seemed to be driving every minute of the time. But it didn't have a professional look to me. I told them I didn't think they'd have a Chinaman's chance." Eaton was so convinced they posed no threat to his magazine, he gave them a list of several thousand of his own subscribers. He also helped them draft a subscription letter that was mailed to a 100,000 people. Of these, over 6,000 people requested trial subscriptions. Luce and Hadden also had a meeting with John Wesley Hanes, an experienced figure on Wall Street. He told them that it was foolhardy to compete with the highly successful Literary Digest. However, he was especially impressed with Hadden: "Hadden was damned convincing... Luce was there, too. They made a good team. But Luce wasn't much of a talker. He thinks faster than he can talk, you know, and sometimes it gets garbled up. But all the time, Hadden would be in there, selling, selling. He just had what he takes. He was intelligent, he was enthusiastic, he was willing to work and work hard. He was the whole ball of wax rolled into one." Culbreth Sudler agreed that Hadden was very impressive in his dealings with potential investors. He later recalled: "Hadden was interested in everybody. His mind was tireless, and he had an almost unparalleled drive coupled with a strong personal discipline." Hanes gave them important advice on how to raise money from investors while retaining control of the company. He told them to create two kinds of stock. Preferred stock would pay dividends to investors sooner, but only the common stock would carry the right to vote on company affairs. Under this plan, Hadden and Luce would each keep 2,775 shares - a total of 55.5%, giving them control of the company. Hadden and Luce used their contacts through the Skull and Bones secret society. A fellow member, Henry Pomeroy Davison, Jr., persuaded his father, Henry Pomeroy Davison, a senior partner at J. P. Morgan, the most powerful commercial bank in the United States at the time, to invest money in the magazine. Davison introduced Luce to fellow partner Dwight Morrow, who also bought stock in the company. Another member, David Ingalls, had married Louise Harkness, the daughter of William L. Harkness, a leading figure in Standard Oil. He had recently died and left $53,439,437 to his family. Louise used some of this money to invest in the magazine. 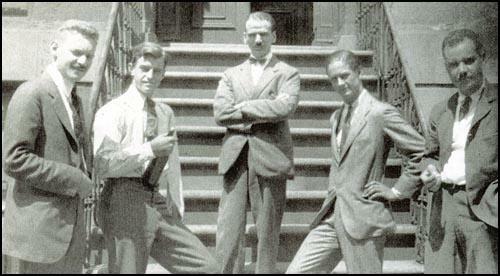 By the summer of 1922 Hadden and Luce had raised $85,675 from sixty-nine friends and acquaintances. Hadden, who was appointed editor of Time Magazine, now began to acquire his staff. Thomas J. C. Martyn, a former pilot in the Royal Air Force during the First World War, who had lost his leg in an aircraft accident, was given the job of Foreign News editor. He had little experience in journalism but Martyn, who was fluent in French and German, seemed to know a great deal about European politics. Another successful appointment was John S. Martin, who specialized in writing humorous stories for the magazine. Roy Edward Larsen, was appointed as circulation manager. He had just left Harvard University, where he was business manager of the college literary magazine, The Advocate. Luce had been impressed by the fact that he had been the first person in history to turn it into a profit-making venture. The first edition of Time Magazine was published on 3rd March, 1923. Only 9,000 copies were sold, a third of what it would take to break even in the first year of business. In an attempt to increase sales, Hadden employed young women to ask for the magazine at news-stands. Their reply was that they had never heard of it. After a few women had requested a copy of the magazine, Hadden arrived and by that time they were in the right mood to take a couple of copies. Despite an increase in revenue, Henry Luce still had trouble paying suppliers. Roy Edward Larsen was asked to come up with a way of finding more income from advertising in the magazine. Hadden suggested the idea of increasing the price of smaller adverts and offering a discount for buying in bulk. This method not only improved revenue but eventually became the industry standard for selling advertising. Larsen devised several different subscription offers. This included paying the cost of postage. The company also supplied a self-addressed and stamped postcard in their mailing. Although Time Magazine claimed it provided an objective view of the world, its editor, Hadden, always sided with the underdog. He ran several stories on the lynching of black men in the Deep South. He also attacked James Thomas Heflin of Alabama, the leading proponent of white supremacy in the Senate. His reporting on race relations provoked complaints from readers who held conservative views on politics. One reader, Barlow Henderson of South Carolina, accused the magazine of a "flagrant affront to the feelings of our people". His main objection was to the policy of giving black people the respectful title of "Mr." After one article about lynching, a reader from Lebanon, Missouri, cancelled his subscription. "I would not want your propaganda sheet even if it came free of charge... One thing this country needs is publications that stand four square for American ideals." Hadden hired a team of four young women to do research. They searched through newspapers and books in search of revealing details that they would then pass onto the journalists. The women also had the job of checking the facts of the articles before they were published in the magazine. The researchers were paid half the wages of the journalists on the magazine and Hadden was therefore able to cut the size of the payroll. Time Magazine targeted the upwardly mobile. It was particularly successful with the younger set of upper-class readers. Hadden wrote that he was not interested in obtaining those readers who read tabloid newspapers. He described them as "gum-chewers, shop girls, taxi drivers, street sheiks, and bummers". In March, 1925, Hadden went on a long vacation. The following month Luce discovered that Time Incorporated had lost $1,958.84 over the previous four months. He decided that he could save a considerable sum of money by relocating to Cleveland. John Penton, claimed he could save Luce $20,000 a year by printing the magazine in the city. Luce signed the contract without telling Hadden. When he arrived home from holiday Hadden had a terrible row with Luce. According to Hadden's friends, Luce's action struck a severe blow to their partnership. Time Magazine moved to Cleveland in August, 1925. The advertising staff remained behind in New York City. Most of the journalists, researchers and office staff refused to relocate. This was partly because Luce refused to pay for their moving expenses. Instead, he sacked the entire staff but offered to reappoint them if they applied for jobs in Cleveland. Thomas J. C. Martyn was furious about the way he was treated and refused to move. 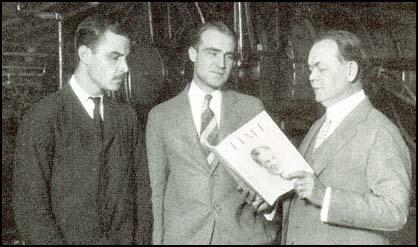 Briton Hadden and Henry Luce with Time's manager in Cleveland. In December, 1925, Roy Edward Larsen organised a new subscription campaign. It was a great success and the magazine's circulation increased to 107,000. However, that year, the company lost $24,000, but this was largely due to the cost of the move to Cleveland. Luce claimed the future looked bright as the relocation had made the magazine more popular outside of New York City. Briton Hadden, the editor of the magazine, created a new style of writing. He was a savage editor who stripped the sentence down, cut extraneous clauses, and used only active verbs. He also removed inconclusive words words like "alleged" and "reportedly". Hadden also liked using the odd obscure word. 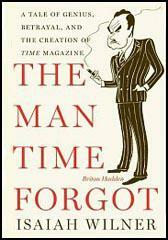 The author of The Man Time Forgot (2006) has pointed out: "By sprinkling the magazine with a few difficult words, Hadden subtly flattered his readers and invited them to play an ongoing game. Those with large vocabularies could pat themselves on the back, while the rest guffawed at Time's bright boys and looked the word up." The editor of Time Magazine was also interested in creating new words. For example, while at Hotchkiss School he described boys who had few friends as being "social light". In his magazine he began using the word "socialite" to describe someone who attempted to be prominent in fashionable society. Hadden wanted a new word for opinion makers. As they thought themselves as wise, he called them by the name of his old Yale prankster group: "pundit". Another word brought into general use was "kudos", the Greek word for magical glory. Henry Luce also developed new words. The most famous of these was "tycoon" to describe successful and powerful businessman. The word was based on "taikun", a Japanese term to describe a general who controlled the country in the name of the emperor. Hadden encouraged his writers to use witty epithets to convey the character and appearance of public figures. Grigory Zinoviev was condemned as the "bomb boy of Bolshevism" and Upton Sinclair was called a "socialist-sophist". Winston Churchill was described as being "ruddy as a round full moon". Benito Mussolini was attacked on a regular basis. John Martin commented that when public figures came under attack from Hadden, it was like being "undressed in Macy's window". Articles in Time Magazine were very different from those found in other newspapers and journals. Isaiah Wilner has pointed out: "Having invented a new writing style that made each sentence entertaining and easy to grasp. Hadden and his writers began to toy with the structure of the entire story. Most newspaper writers tried to tell everything in the first one or two paragraphs. By printing the most important facts first, they destroyed the natural narrative of news. Hadden trained his writers to act as if they were novelist. He viewed the whole story, including the headline and caption, as an information package." Briton Hadden gradually settled down to working in Cleveland. He told a friend: "We think we're hot stuff here, big frogs in a small puddle. But what the hell are we? A bunch of kids, deafened by adulation. We sit at dinner parties with people twice our age and they listen to us. We think we're some punkins. We must get back to New York where we have competition and can't get smug." Laird Goldsborough was appointed as Foreign News editor of the magazine. Isaiah Wilner has argued: "Short and over-weight with long dark hair that flowed over the back of his collar, Goldsborough was partly lame due to a childhood hip ailment. He limped along with the help of a cane, sweating profusely.... Goldsborough wrote like a silkworm, spinning out a story from start to finish almost without stopping. When he came up with a particulary delicious phrase, he would pause to savor it, purring like a cat, then read it aloud and crackle." Goldsborough held extreme right-wing opinions but this was kept under control by Hadden, who instructed his journalists to tell both sides of an event. The two men disagreed about the merits of Benito Mussolini. Hadden was a strong supporter of democracy and severely attacked the rule of Mussolini, who he described as a "tin-pot dictator". Goldsborough on the other hand praised Mussolini as a bold leader. Roy Edward Larsen worked very closely with Hadden in the various campaigns to increase the circulation of the magazine. One strategy was to criticise individual cities. For example, Hadden commented that Greensboro was "second-rate". He also attacked different aspects of Denver and Indianapolis. This created great controversy but the following year the readership had increased between 50 and 100% in these cities. Larsen wrote to Hadden: "The numbers speak for themselves. What we have done in Denver and Indianapolis, we can do in hundreds of cities and towns throughout the country." In 1926 circulation reached 111,000. Advertising revenues rose to $240,000 and the company made a profit of $10,000. The main concern was that sales from news-stands remained poor. It was decided to carry out a study into the situation. One newsdealer commented: "What you need on the cover is pretty girls, babies, or red and yellow." Several people interviewed said that the black and white magazine cover was not appealing to the potential customers. On 3rd January, 1927, Time Magazine appeared with a red-bordered front cover. Atwater Kent also paid $1,400 for the back-cover that carried a bold yellow advertisement for the company. At the beginning of 1927, Briton Hadden agreed to switch jobs with Henry Luce. Hadden now began exploring ways of increasing advertising revenue. He carried out a survey of the magazine's readership. He then published a booklet that was distributed to advertisers. It claimed that the magazine was read by people who were "wealthy, powerful, informed and energetic". He was "an informed consumer who spent his money freely and paid attention to what companies said to him." That year advertising revenues climbed to nearly $415,000. Luce also made changes as editor. Laird Goldsborough was Foreign News editor of the magazine. Goldsborough held extreme right-wing opinions but this was kept under control by Briton Hadden, who instructed his journalists to tell both sides of an event. The two men disagreed about the merits of Benito Mussolini. Hadden was a strong supporter of democracy and severely attacked the rule of Mussolini, who he described as a "tin-pot dictator". Goldsborough on the other hand praised Mussolini as a bold leader. Goldsborough found his new editor as much more sympathetic to his right-wing views. Isaiah Wilner has pointed out: "No sooner had Luce taken the editor's seat than he began to twist and distort the news. Time's emerging bias first grew evident in Foreign News. Laird Goldsborough quickly impressed Luce with his writing ability and knowledge of foreign events." George Seldes has argued that Luce "permitted an outright pro-fascist, Laird Goldsborough, to slant and pervert the news every week." Henry Luce's secretary, Katherine Abrams, commented: Luce is the smartest man I ever knew, but Hadden had the real editorial genius... He was warm and he was human and he had what Luce lacks, an instinct for people." Culbreth Sudler added: "Briton Hadden was Timestyle. It was Timestyle that made Time popular nationwide, and therefore it was Hadden who made Time a success." By 1927 was selling over 175,000 copies a week. Briton Hadden commented on his relationship with Henry Luce to a friend: "It's like a race. Luce is the best competition I ever had. No matter how hard I run, Luce is always there." Luce was told about this and later he recalled: "If anyone else had said that, I might well have resented the implication that the best I could do was to keep up with him. Coming from Hadden, I regarded it, and still regard it, as the highest compliment I have ever received." Polly Groves, who worked at Time Magazine, remarked: "Everyone who knew Briton Hadden loved him. You couldn't love Henry Luce. You admired him but could not love him." In 1928 the two men argued about business matters. Henry Luce was keen to publish a second magazine that he wanted to call Fortune. Hadden was opposed to the idea of publishing a journal devoted to promoting the capitalist system. He considered the "business world to be vapid and morally bankrupt". Together, Hadden and Luce owned more than half of the voting stock and were able to retain control of the company. However, Luce was unable to publish a new magazine without the agreement of his partner. In December 1928 Briton Hadden became so ill he was unable to go into the office. Doctors diagnosed him with an infection of streptococcus. Hadden believed he had contracted the illness by picking up a wandering tomcat and taking it home to feed it. The ungrateful cat attacked and scratched Hadden. Another possibility was that he had been infected when he had a tooth removed. The following month he was taken to Brooklyn Hospital. Doctors now feared that the bacteria had spread through his blood-stream to reach his heart. Luce visited Hadden in hospital and tried to buy his shares in the company. Nurses reported that these conversations ended up in shouting matches. One nurse recalled that Hadden and Luce had yelled at each other so loudly that they could be heard from behind the closed door. Doctors believed that Hadden was wasting his precious energies in these arguments and it was partly responsible for his deteriorating condition. On 28th January, 1929, Hadden contacted his lawyer, William J. Carr and asked him to draw up a new will. In the document, Hadden left his entire estate to his mother. However, he added that he forbade her from selling the stock in Time Incorporated for forty-nine years. His main objective was to prevent Luce from gaining control of the company they had founded together. Henry Luce visited Hadden every day. He later recalled: "The last time or two that I was there, I guess I knew he was dying and maybe he did. It seemed to me that he knew and every now and again was wanting to say something, whatever it might be he wanted to say in the way of parting words or something. But he never did, so that there was never any open recognition between him and me that he was dying." Briton Hadden died of heart failure on 27th February, 1929. The following week Hadden's name was removed from Time's masthead as the joint founder of the magazine. Luce also approached Hadden's mother about buying her stock in Time Incorporated. She refused but her other son, Crowell Hadden, accepted his offer to join the board of directors. Crowell agreed to try and persuade his mother to change her mind and in September 1929, she agreed to sell her stock to a syndicate under Luce's control for just over a million dollars. This gave him a controlling interest in the company. Ralph Ingersoll was appointed as managing editor of Time Magazine in 1930. However, he grew critical of what Henry Luce was trying to do with the magazine: "Time's technique for handling news is so simple that it seems to have eluded several generations of critics and yet it is almost solely responsible for (A) Time's monumental commercial success and (B) Time's equally monumental failure in the fields of ethics, integrity, and responsibility. The problem Henry R. Luce and the late Briton Hadden tackled when they set out to invent their new kind of weekly news magazine was how to condense a week's news on all fronts: national, international, cultural, and business into a package of words that could be read cover to cover in a couple of hours." Ingersoll went onto argue: "Controversial matters, such as political news, were handled by snipping quotes from both sides. But Luce and Hadden felt that this approach had limitations both as to the quantity of news it could handle and its readability... Luce and Hadden's solution was brilliant. Instead of digesting the news, they would rewrite it into short articles, each having its own literary form: a beginning, a middle, and an end, though not of course necessarily in that sequence. Thus they wrote their own literary license for a new kind of news writing that was not news writing at all but good old-fashioned, time-tested fiction writing." In 1936 Laird Goldsborough attempted to persuade Luce to take sides in the conflict in Spain. George Teeple Eggleston, who worked for the company at the time, has claimed that it was Goldsborough who persuaded Luce to support General Francisco Franco during the Spanish Civil War. According to Eggleston: "Time's conservative foreign news editor, Laird Goldsborough, promptly slanted all news stories in his department in favor of General Franco's rebel insurgents." This approach was criticised by Archibald MacLeish, who worked on Fortune, another magazine owned by Luce, who "promptly bombarded Luce memos denouncing Franco's coalition of landowners, the Church, and the army". Goldsborough responded by arguing: "On the side of Franco are men of property, men of God, and men of the sword. What positions do you suppose these sorts of men occupy in the minds of 700,000 readers of Time? ... They resent communists, anarchists, and political gangsters - those so-called Spanish Republicans." In April 1939 Whittaker Chambers joined Time Magazine as a book and film reviewer. According to Jonathan P. Herzog, the author of The Spiritual-Industrial Complex: America's Religious Battle Against Communism in the Early Cold War (2011): "Chambers slowly climbed through the ranks of Time, Inc. and had entered the inner circle of advisers that Luce depended on for business and editorial decisions. In 1944 Luce made Chambers the head of Time's Foreign News. Predictably, Chambers moulded Time into an anti-Communist mouth-piece." Marshall McLuhan was highly critical of Time Magazine: "The overwhelming fact about Time is its style. It has often been said that nobody could tell the truth in Time style. Time is a nursery book in which the reader is slapped and tickled alternately. It is full of predigested pap, spooned out with confidential nudges. The reader is never on his own for an instant, but, as though at his mother's knee, he is provided with the right emotions for everything he hears or sees as the pages turn... Totalitarianism engendered by the mass hypnosis of power, glitter, and the spectacle of regular ranks rather than insight or intelligibility is the object of all of Time's technical brilliance. Meanwhile, the editors of Time stand at mock attention in the reviewing stand, thumbing their noses at humanity." David Halberstam has pointed out in The Powers That Be (1979): "Luce's politics hardened in the postwar years and Time had become increasingly Republican in its tone. He had been stunned by Truman's defeat of Dewey in 1948. Then in the fall of 1949 China had fallen, the Democratic administration had failed to save Chiang, and that was too much; Truman, and even more Acheson, would have to pay the price. Time was now committed and politicized, an almost totally partisan instrument. The smell of blood was in the air. There was a hunger now in Luce to put a Republican back in power. It was as if Luce, between elections, stood as the leader of the opposition, a kingmaker who had failed to produce a king. The fall of China and the rise of a post-war anti-Communist mood had produced the essential issue to use against the Democrats: softness on Communism." Some left-wing figures believed they were persecuted by Time Magazine. Rockwell Kent commented: "Time is too strongly inclined to the ultra-right to be trustworthy in the forming of fair judgment in current political events. I feel itsstyle of writing to be objectionable and inclined to value smartness above truth." Howard Fast agreed: "Any reading of Time, even casual, will provide you with distortions and inaccuracies by the bushel." 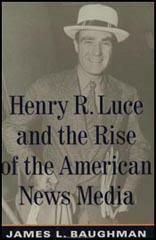 According to Carl Bernstein, Luce's close friend Charles Douglas Jackson, the publisher of Life Magazine, was "Henry Luce's personal emissary to the CIA". He also claimed that in the 1950s Jackson had arranged for CIA employees to travel with Time-Life credentials as cover. Drew Pearson supported this view: "Life magazine is always pulling chestnuts out of the fire for the CIA; and I recall that C. D. Jackson of the Life-Time empire was the man who arranged for the CIA to finance the Freedom Balloons. C. D. Jackson, Harold Stassen and the other boys who went with me to Germany spent money like money while I paid my own way. I always was suspicious that a lot of dough was coming from unexplained quarters and didn't learn until sometime later that the CIA was footing the bill." Jonathan P. Herzog has argued that Luce was motivated by his religious faith: "While he counted anti-Communists like Mundt, Cardinal Spellman, and Chambers as allies, he viewed the Communist threat differently. In his view, it was a symptom and not a disease. Like his wife, Clare, he understood faith as a psychological imperative sought by all people. If religious faith waned, other dogmas would take its place. The success of Communism, then, was not attributable to its message but rather to the fact that it offered people the spiritual certainty they no longer found in Christianity. All the shocking anti-Communist propaganda and shopworn tributes to democracy that America could muster would fail to arrest the Marxian surge. But if Americans filled the spiritual vacuum, if they made religious faith commensurate with military and economic power, then Communism would dissipate." Henry Luce and Clare Booth Luce were strong opponents of Fidel Castro and his revolutionary government in Cuba. They joined forces with Hal Hendrix, Paul Bethel, William Pawley, Virginia Prewett, Dickey Chapelle, Ernest Cuneo, Edward Teller, Arleigh Burke, Leo Cherne, Sidney Hook, Hans Morgenthau and Frank Tannenbaum to form the Citizens Committee to Free Cuba (CCFC). On 25th March, 1963, the CCFC issued a statement: "The Committee is nonpartisan. It believes that Cuba is an issue that transcends party differences, and that its solution requires the kind of national unity we have always manifested at moments of great crisis. This belief is reflected in the broad and representative membership of the Committee." The Luce family also funded Alpha 66. In 1962 Alpha 66 launched several raids on Cuba. This included attacks on port installations and foreign shipping. The authors of Deadly Secrets: The CIA-Mafia War Against Castro and the Assassination of JFK (1981) argues that Clare Boothe Luce paid for one of the boats used in these raids: "The anti-communist blonde took a maternal interest in the three-man crew she adopted... She brought them to New York three times to mother them." The Luce media empire led a campaign against the presidency of John F. Kennedy. As Richard D. Mahoney has pointed out: "The cause of liberating Cuba from Castro had become the grail of the Republican right. Life Magazine editorially adopted the cause of the exiles as its own, with photo essays on the raids.... Life's full-throttle opposition to Kennedy... was a problem for the administration. Along with Time, also published by Luce, it was one of the two or three most influential magazines in the country. In April, the president had invited the publisher and his very political wife to lunch at the White House. The Kennedy charm did nothing to deter or otherwise disarm them. The Luces walked out of the lunch to protest the president's warning to cool it on Cuba." When Kennedy was assassinated, Charles Douglas Jackson purchased the Zapruder Film on behalf of Luce. David Lifton points out in The Great Zapruder Film Hoax (2004) that: "Abraham Zapruder in fact sold the film to Time-Life for the sum of $150,000 - about $900,000 dollars in today's money... Moreover, although Life had a copy of the film, it did little to maximize the return on its extraordinary investment. Specifically, it did not sell this unique property - as a film - to any broadcast media or permit it to be seen in motion, the logical way to maximize the financial return on its investment... A closer look revealed something else. The film wasn't just sold to Life - the person whose name was on the agreement was C. D. Jackson." Luce published individual frames of Zapruder's film but did not allow the film to be screened in its entirety. Soon after the assassination Charles Douglas Jackson also successfully negotiated with Marina Oswald the exclusive rights to her story. Peter Dale Scott argues in his book Deep Politics and the Death of JFK (1996) that Jackson, on the urging of Allen Dulles, employed Isaac Don Levine, a veteran CIA publicist, to ghost-write Marina's story. This story never appeared in print. Time is a weekly news magazine, aimed to serve the modern necessity of keeping people informed, created on a new principle of complete organization. Time is interested - not in how much it includes between its cover - but in how much it gets off its pages into the minds of it's readers. Luce's politics hardened in the postwar years and Time had become increasingly Republican in its tone. He had been stunned by Truman's defeat of Dewey in 1948. Then in the fall of 1949 China had fallen, the Democratic administration had failed to save Chiang, and that was too much; Truman, and even more Acheson, would have to pay the price. Time was now committed and politicized, an almost totally partisan instrument. The smell of blood was in the air. There was a hunger now in Luce to put a Republican back in power. It was as if Luce, between elections, stood as the leader of the opposition, a kingmaker who had failed to produce a king. The fall of China and the rise of a post-war anti-Communist mood had produced the essential issue to use against the Democrats: softness on Communism. If the Democrats for almost two decades had exploited the Great Depression as their essential issue-all Republicans wore top hats and forced all laboring men into breadlinesnow Republicans, with Luce at their forefront, were fixing on foreign affairs as the Democrats' Achilles' heel. It was a brutal time; serious foreign policy issues with emotional overtones were made more emotional by Luce; his magazine encouraged a kind of political primitivism. Time tried to convince its readers that the disaster in Asia had been caused by bad and unworthy Democrats at the State Department. It also encouraged them to think that a Republican administration would deal more forthrightly and more morally with the Communists, roll them back a little. Ttime's heroes during the late forties and early fifties were men like Foster Dulles and Douglas MacArthur, who talked of bringing moral standards to foreign affairs. Of MacArthur, Time was particularly worshipful, writing in that period when he was the Consul General of Japan: "Inside the Dai Ichi building, once the heart of a Japanese insurance empire, bleary-eyed staff officers looked up from stacks of papers, whispered proudly, 'God, the man is great.' General Almond, his chief of staff, said straight out, 'he's the greatest man alive.' And reverent Air Force General George E. Stratemeyer put it as strongly as it could be put. ..'he's the greatest man in history."' Acheson was the villain, savaged by Luce in those years. Clearly Acheson was not a patch on MacArthur: "What people thought of Dean Gooderham Acheson ranged from the proposition that he was a fellow traveller, or a wool-brained sower of `seeds of jackassery,' or an abysmally uncomprehending man, or a warmonger who was taking the U.S. into a world war, to the warm if not so audible defense that he was a great Secretary of State." Clearly the lines were being drawn. Luce had once told Felix Belair that Belair did not understand what being a Republican really meant, that it was like being part of a family. While he counted anti-Communists like Mundt, Cardinal Spellman, and Chambers as allies, he viewed the Communist threat differently. In his view, it was a symptom and not a disease. Like his wife, Clare, he understood faith as a psychological imperative sought by all people. If religious faith waned, other dogmas would take its place. The success of Communism, then, was not attributable to its message but rather to the fact that it offered people the spiritual certainty they no longer found in Christianity. All the shocking anti-Communist propaganda and shopworn tributes to democracy that America could muster would fail to arrest the Marxian surge. But if Americans filled the spiritual vacuum, if they made religious faith commensurate with military and economic power, then Communism would dissipate. Though his knowledge of Communism may have been underdeveloped, Luce spoke on religious matters with justified authority. Employees considered Luce's insistence upon riding alone in the elevator the thirty-six floors to his penthouse each morning a sign of elitism, but he actually took that time to pray. Luce was the son of Christian missionaries to China, and his father, a professor of theology, endowed him with a level of religious knowledge uncommon in businessmen of the age. Luce delighted in speaking before religious groups and fancied himself an amateur theologian. He was active in the Federal Council of Churches and the National Conference of Christians and Jews, and he sat on the board of directors of Union Theological Seminary.